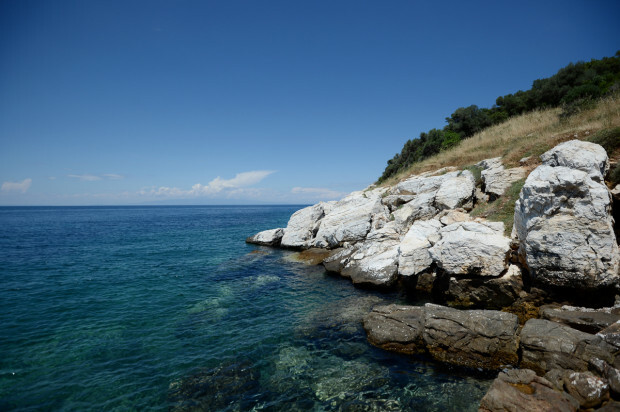 On June 6, after a visit to Hilandar monastery, His Holiness Patriarch Kirill of Moscow and All Russia went by water to the Monastery of Vatopedi. At the holy gates he was welcomed by the abbot, Archimandrite Ephraim, and the brethren. 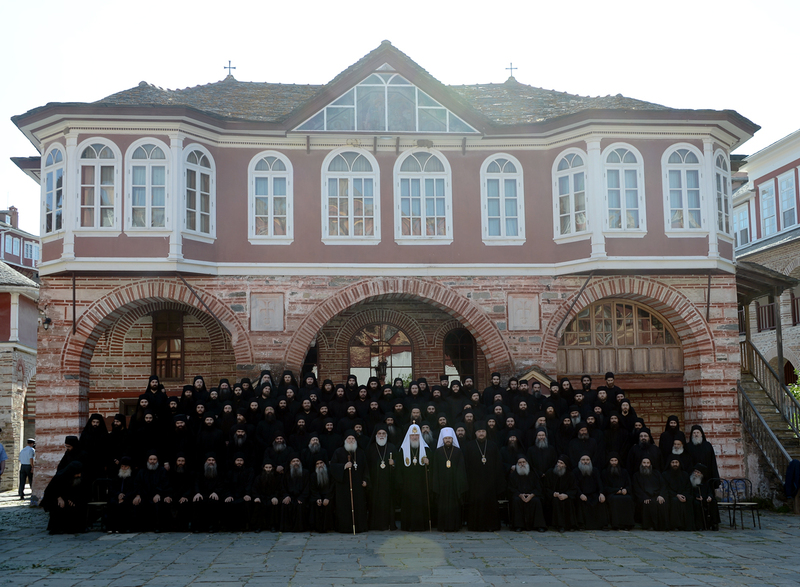 After a thanksgiving celebrated by His Holiness, Father Ephraim addressed His Holiness, saying in particular, ‘Fresh are still the memories of our trip to Russia to bring in the Sash of Our Lady, the most significant shrine of Vatopedi Monastery. It stayed there for 40 days and visited 15 cities, in which many believers could venerate it and receive spiritual reinforcement from it. There were so many believers that it can be considered the greatest peaceful gathering of people in the world in the 20th and 21st centuries. Almost four million people venerated the Holy Sash, and many of them stood in the line for over 17 hours. Many miracles happened at that time; they continue today too, especially the miracles of procreation… We remember the word Your Holiness addressed to the mass media in the last days of our stay in Russia: ‘We have become witnesses of the great power of the Orthodox Russian people’. 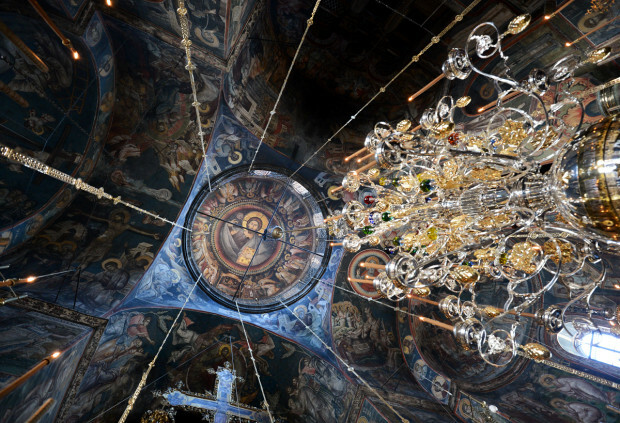 Yes, the power of the Church is great in our days too, and the Russian Church as the most numerous one has a great power and influence in the world’. 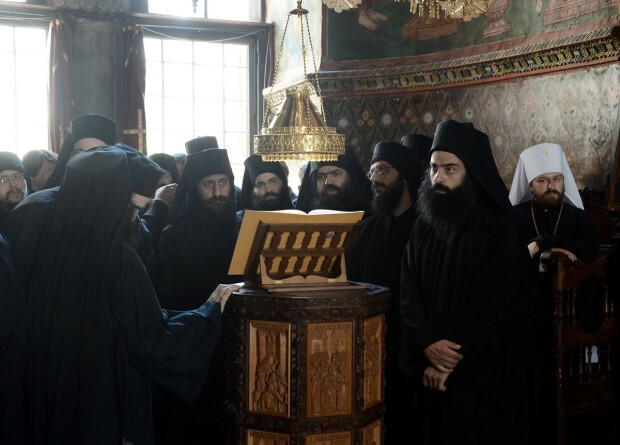 ‘We live at a time’, Father Ephraim continued, ‘when the secularization and the secularized way of life threatens even the life of the Church. Traditional values are challenged and all kinds of crisis multiply. 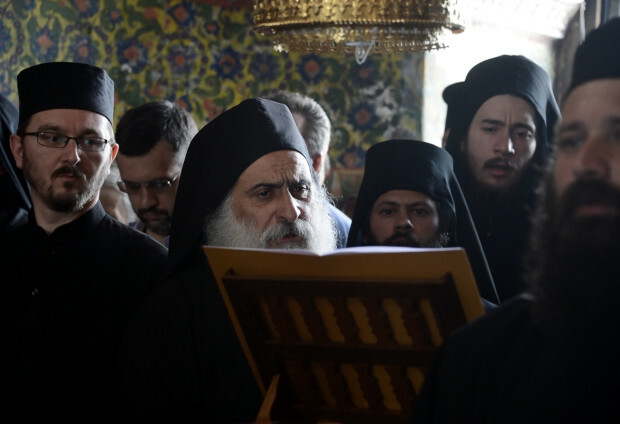 The time has come to unite the entire Orthodoxy’. Speaking in response, Patriarch Kirill pointed to the millennium-long history of relations between the Holy Mount and the Russian Orthodox Church. 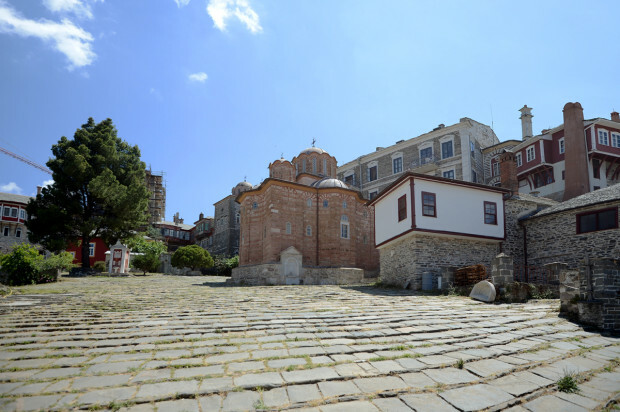 Among many names associated with these relations is that of ‘Maxim the Greek, a Vatopedi monk, who worked for many years to enlighten the Russian people by translating Greek church books into Church Slavonic’. He reiterated the significance of the bringing of the Sash of Our Lady to the Russian Orthodox Church in 2011. ‘You are right in noting that history does not remember of such a great peaceful gathering of people. And it happened in the 21st century associated, they say, with a crisis of faith when churches become deserted in many countries and people reject the religious knowledge on the basis of a falsely understood meaning of knowledge. 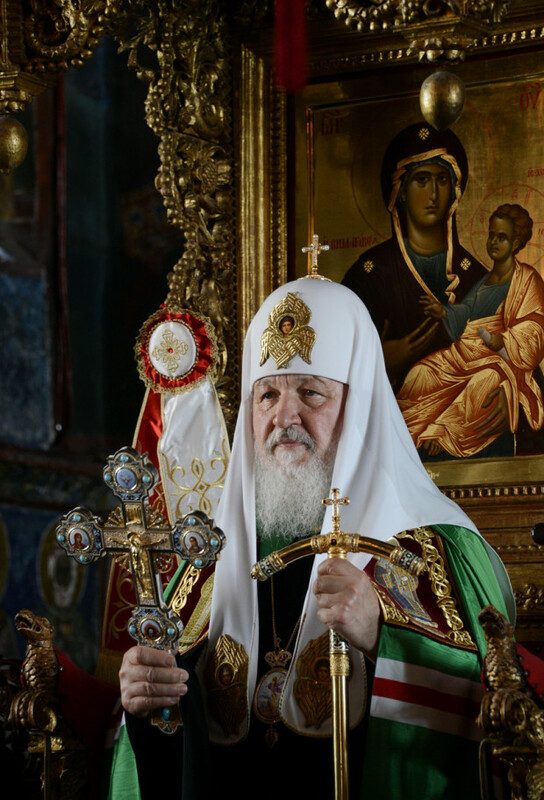 It is at that moment of crisis in spiritual life, thanks to your gift of bringing the Holy Sash to Russia, a great miracle was revealed to us and to the whole world – the miracle of the revival of faith among a people who were subjected to elimination for 70 years’. ‘Despite lots of deviations from faith throughout the world and a great many crises spreading on the globe, despite the fact that many have lost hope for the future and many have truth and lie confused in their minds and that the very notion of truth is obliterated to threaten the very survival of the human race, we live by the hope that by God’s grace every evil and untruth is overcome and that God is stronger than the devil and that He has defeated evil by His resurrection’. 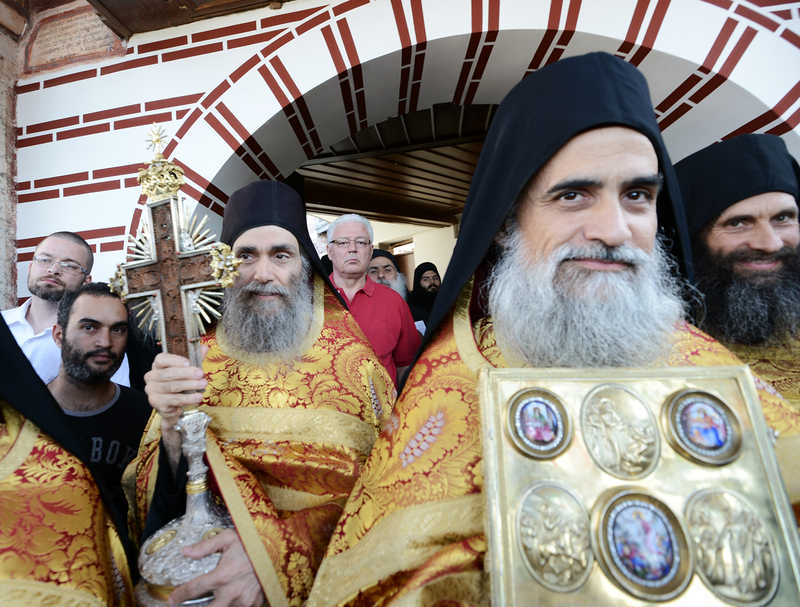 Patriarch Kirill presented the monastery with an Icon of Our Saviour and gave the abbot a pectoral cross. 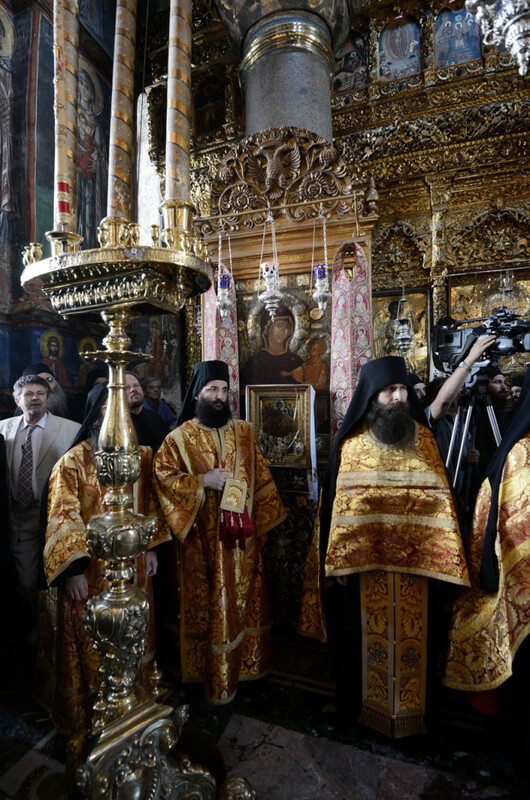 After the thanksgiving His Holiness visited the side-altar of the Cathedral of the Annunciation, in which the Icon of Our Lady the Joy and Consolation is kept, and venerated the shrine. 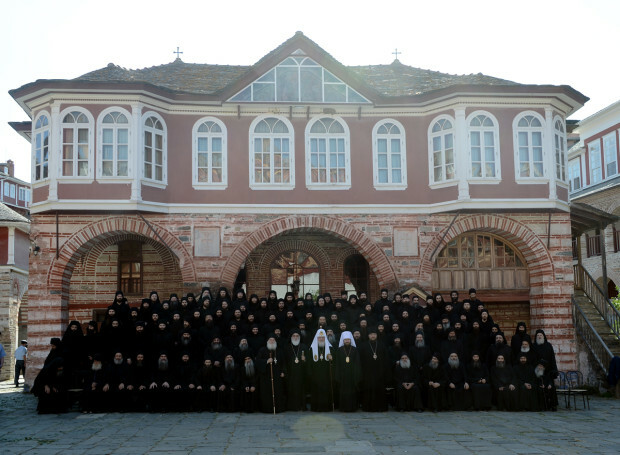 During the fraternal repast that followed, Patriarch Kirill spoke of the importance of Vatopedi monastery as a center of Orthodox spirituality and the tremendous changes which took place on the Holy Mount, showing that ‘people have a need for monastic life’. Among the speakers was Metropolitan Apostolus of Miletus, representative of the Patriarchate of Constantinople on Holy Mount Athos, who was instructed by His Holiness Patriarch Bartholomew to accompany Patriarch Kirill in his pilgrimage to Athonite monasteries. 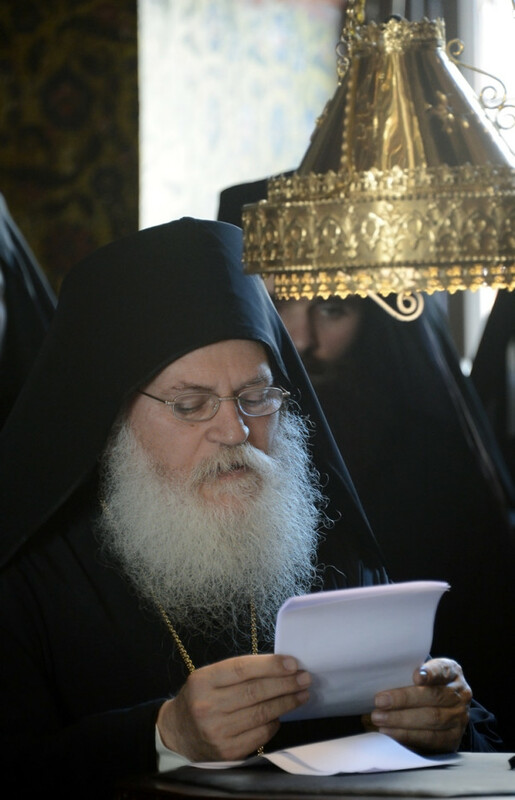 He shared the remembrances of his first meeting with Patriarch Krill thirty years ago and pointed to the importance of his ministry and the tasks facing the Primate of the Russian Church. 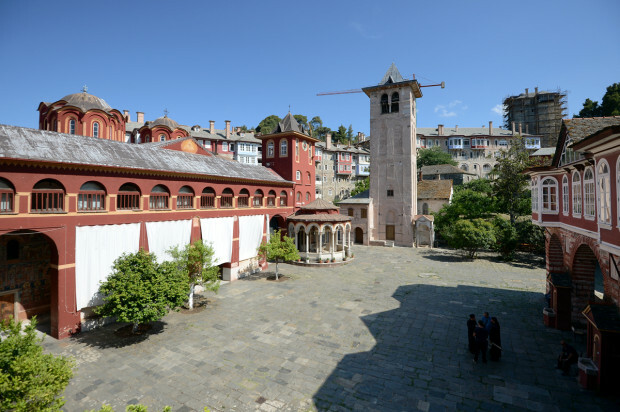 The Mount Athos Governor Aristos Kasmiroglou, in his speech, said that he heard from a hierarch that there is something more than the universe. It is love. ‘It is love that Your Holiness has brought with his coming, which is an important event for us. You are very welcome’.